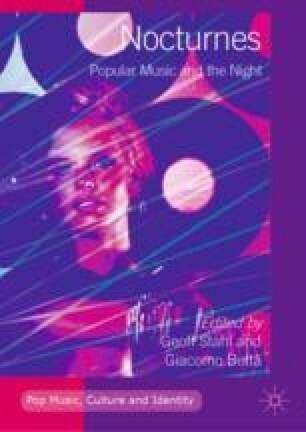 The Introduction outlines many of the key concepts regarding the night and popular music, with a particular emphasis on their relationship to and within the city. A number of historians, sociologists and theorists of the city at night are covered, as are many approaches to music in the city. Bridging these different bodies of scholarship, the editors outline many of the concerns that relate to thinking through the complicated relationship between music and the night, from policing the streets and developing policies, to some of the more liberating dimensions associated with the nocturnal dimensions of popular music, set out here as a preamble to the various discussions taken up in the ensuing chapters. Codrea-Rado, Anna. 2017. What Europe’s “Night Mayors” Can Teach New York. The New York Times, August 30. https://www.nytimes.com/2017/08/30/arts/new-york-night-mayor-europe.html. Groening, Stephen. 2014. Groening, Stephen, and Friedrich Kittler: Towards a Meteorology of the Media. Transformations 25: 1–9. http://www.transformationsjournal.org/wp-content/uploads/2016/12/Groening_Transformations25.pdf. Henley, Jon. 2016. The Stuff of Night Mayors: Amsterdam Pioneers New Way to Run Cities After Dark. The Guardian, March 21. https://www.theguardian.com/cities/2016/mar/21/night-mayor-amsterdam-holland-mirik-milan-night-time-commission. Kassabian, Anahid. 2001. Ubiquitous Listening and Networked Subjectivity. Echo 3 (2). http://www.echo.ucla.edu/Volume3-issue2/kassabian/Kassabian1.html#topofkassabian. Macdonald, Marie-Paule. 2017. Trajectories and Territories. Hendrix Soundscapes. Scapegoat 10: 18–28. http://www.scapegoatjournal.org/docs/10/5.pdf. O’Sullivan, Feargus. 2017. How to Be a Good “Night Mayor.” Citylab, September 26. https://www.citylab.com/solutions/2017/09/america-discovers-the-night-mayor/539505/. ———. 2015. Media and the Urban Night. Articulo: Journal of Urban Research 11. http://journals.openedition.org/articulo/3098, https://doi.org/10.4000/articulo.3098. ———. 2017. Dossier: German Nights. Scapegoat 10: 221–222. http://www.scapegoatjournal.org/docs/10/26.pdf. Straw, Will, and Christie Pearson. 2017. Editorial. Scapegoat 10: 55–56. http://www.scapegoatjournal.org/docs/10/2.pdf.